Salt & Straw is an ice cream company based in Portland, Oregon. The company was launched in 2011 by cousins Kim Malek and Tyler Malek. Salt & Straw began as a food cart on Alberta Street, Portland, Oregon and three months later the company opened its first brick-and-mortar location. Since opening in 2011, Salt & Straw has opened three other locations in Portland and offers a home delivery service throughout the US. In order to ship ice cream nationwide delivery, the company packs its ice cream in dry ice and kraft paper. Salt & Straw has locations in Portland, Los Angeles, San Francisco, San Diego, and Seattle. In 2016, Salt & Straw developed new flavors from "food waste"-edible by-products of the food production process. New flavors were made with overripe strawberries, spent brewing grains and near-expiration date vegan mayonnaise. Proceeds from the sales of the featured flavors from its Portland stores ($3,000) were donated to Urban Gleaners, a Portland, nonprofit. Salt & Straw creates little food waste or scraps, because its products are frozen. When an item is no longer offered on its menu, any leftover ice cream is donated to a nonprofit. Salt & Straw was initially started in Portland, but has since spread across the West Coast. ^ Anderson, Jennifer. "Salt and Straw: quirky, tasty, green". The Portland Tribune. Retrieved 6 May 2014. ^ O'Hara, Gail. "Portland, Oregon: Salt and Straw". www.kinfolk.com. Retrieved 6 May 2014. ^ "A Visit to Salt and Straw". www.theKitchn.com. Retrieved 6 May 2014. ^ Russell, Michael (April 25, 2018). "Salt & Straw is going to Disneyland". OregonLive.com. Retrieved 25 April 2018. ^ Aiken, Kristen. "Salt & Straw's Newest Ice Cream Is Made With Bone Marrow". Huffington Post. Retrieved 6 May 2014. ^ Li, Laura. "31 Days of Artisan Ice Cream". Redbook. Retrieved 6 May 2014. ^ "10 Ice Cream Shops You Need to Visit". GQ. Retrieved 6 May 2014. ^ "Bits and Bites: News You Can Eat". Wall Street Journal. Retrieved 6 May 2014. ^ Hanel, Marnie. "Salt and Straw Portland Chef Ice Cream Series". www.bonappetit.com. bon appetit. Retrieved 12 June 2014. ^ "Salt & Straw Flavors". saltandstraw.com. Retrieved 6 May 2014. ^ Centoni, Danielle. "Portland Kids Create Salt & Straw's Newest Flavors and They Rock". pdx.eater.com. Eater. Retrieved 12 May 2015. ^ Cook, Dan (September 26, 2017). "Wasted". Oregon Business Magazine. 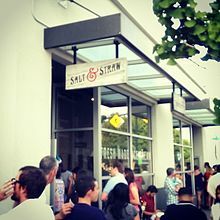 Wikimedia Commons has media related to Salt & Straw.